Most people understand that Phoenix, Arizona, is located in the Sonoran desert, which means it experiences extremely high temperatures and remains relatively dry throughout the year. However, this doesn't mean that the Valley of the Sun doesn't see its fair share of rain annually, which can sometimes lead to devastating results. In the Phoenix area, the average annual rainfall that usually accumulates is between four and eight inches, which isn't much compared to other major cities in the United States. Still, Phoenix gets more rain than Las Vegas, which averages only about four and a half inches per year, but Los Angeles gets about twice the amount, and Seattle gets about four times more than the Valley of the Sun. Phoenix does see its share of extremes; in 2008, 9.58 inches of rain fell on the city, and in 2002, only 2.82 inches of rain fell in the area. The annual average rain in Phoenix from 1971 to 2000 was 8.29 inches, and from 2000 to 2015 it was 6.54 inches, according to measurements taken at the Phoenix Sky Harbor International Airport, which is where official weather measurements are recorded for the city. There are times during the year when it is more likely to rain than at other times. The Sonoran Desert is actually one of the wettest deserts in the world, with two "rainy" seasons that take place from December to March and June to September. 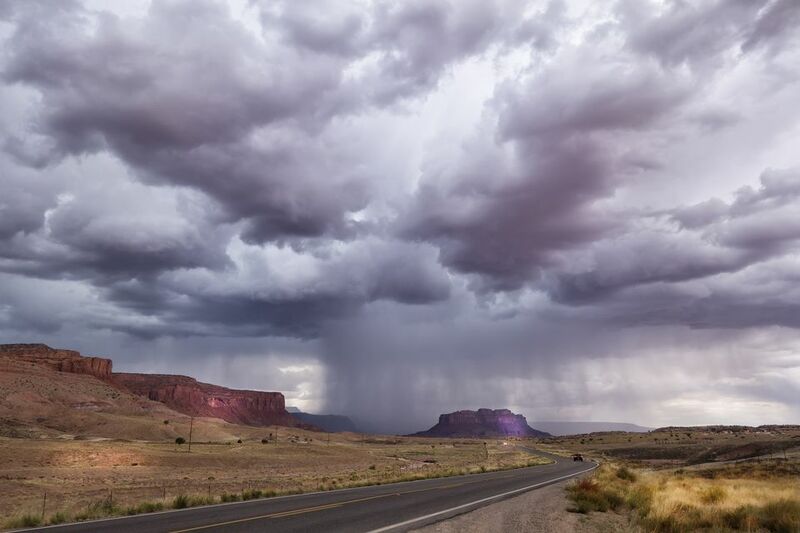 In the Spring, the rains follow California patterns, and you can often predict when wet days will come to Phoenix based on when Los Angeles gets rain, making it easy to plan ahead if you're traveling during that time of year. However, from mid-June through September, Phoenix experiences monsoon thunderstorms. It is not unusual for there to be high winds and rain during that time, often resulting in flooded roads and property damage. There are also occasional microbursts; in September 2014, for instance, Phoenix received more than five inches of rain in just one month, which was very unusual. Because it doesn't rain very often in the Phoenix area, there are a few things to remember about driving in wet weather when you're visiting the Valley of the Sun. Windshield wipers dry out. They are made of rubber, and when you go weeks or months at a time without rain, especially in dry heat like Phoenix has, they may crack and break when you need them most. The rubber parts of the windshield wipers are easy to replace. Local auto parts stores carry a supply, but those stores may run out when the rain in Phoenix finally comes. Make sure your wipers are still in good condition and ready to help with visibility during Phoenix rain showers by periodically using the windshield washer fluid. That way, you can tell if they have separated, cracked, or are otherwise in need of replacement. Roads can be extra slick during the rain. During dry periods, a buildup of dirt and oils develops on roads that may become very slick when that rain finally arrives. Leave extra room between your car and the car in front of you in case you need to make a sudden stop. Make sure you know how to handle your vehicle if you get caught in a skid or hydroplaning situation by reading the vehicle's manual. Phoenix rarely has consecutive days of light drizzle. When the rain comes, it usually comes down hard and fast, which is why washes and low places quickly fill up with water. If a road is flooded, don't assume that you can just drive your vehicle through it. Each year, many rescues must be performed for stranded motorists who tried to drive through raging washes or standing water that was deeper than they thought. If you happen to be one of those people, you could even be charged under the Stupid Motorist Law.